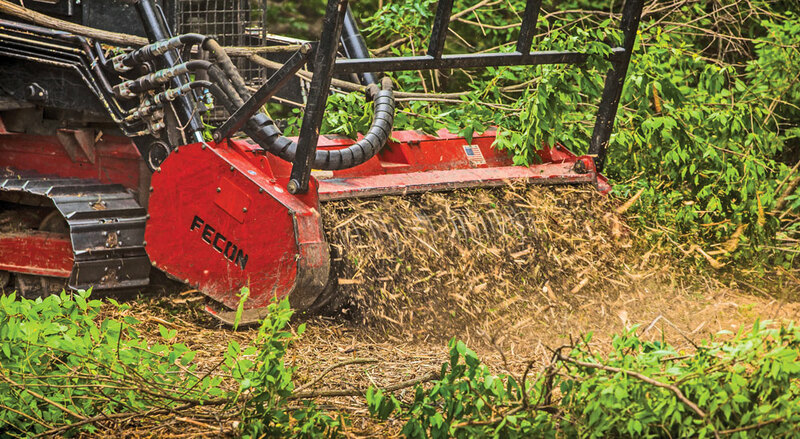 Measuring Mulchers: How Do You Choose the Right Rotary Brush-Cutting Attachment? Mulching attachments are becoming increasingly popular among a wide range of industries. They extend the versatility of compact equipment such as track loaders and compact excavators as they efficiently and effectively remove unwanted vegetation in right-of-way clearing projects, fire fuels reduction thinning, residential and commercial site preparation/land clearing and more. They eradicate trees and stumps down to ground level — shredding standing trees as well as those already on the ground. Depending upon horsepower, they can often handle a steady diet of 4- to 6-in. diameter materials and ingest 6- to 8-in. diameter materials intermittently. Many manufacturers offer mulchers and attachments, so there are numerous options to choose from. But one size doesn’t fit all when considering the purchase of a mulching attachment. The following paragraphs will serve as a primer on what to look for and thus what to avoid in your search for a mulching attachment. While there are differences among the various mulcher attachments available, they all have some common components — namely a hydraulic motor, rotor, cutting tools and housing. We’ll look at these in turn, as well as consider some options. The rotor is a drum which holds the cutting tools. Several rotor styles are available to suit customer preferences, depending upon what kind of conditions will be encountered and what type of cutting tools will be used. 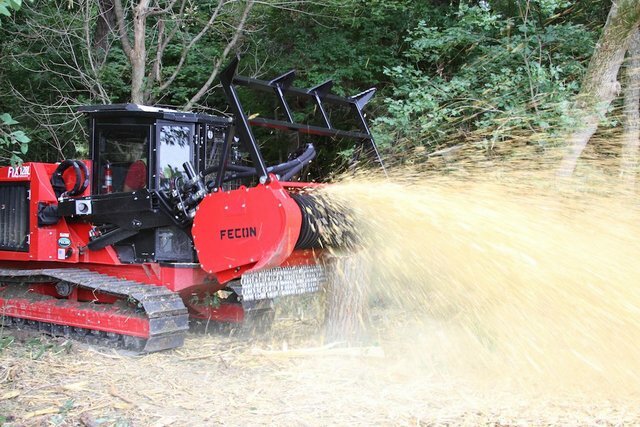 While the cutting tools are where the rubber meets the road so to speak, the rotor design is also vital to the success of any mulching venture. A staggered or spiral tool design is more aggressive in feeding materials and helps with material sizing. Tool holders are important, as this portion of the rotor takes huge impact forces while mulching. Tool holders that are not properly matched to the rotor or tool can fail, causing damage to the rotor and downtime for the operator. Let’s look at some options available. A smooth rotor surface with a spiral tool pattern delivers efficient mulching performance — especially when working in deep snow or in the soil. When constructed of heavy-duty materials and with components like forged bolt-on rotor stub shafts and severe-duty rotor bearings, this style is well suited for the rigors of mulching in remote areas. A depth control type rotor with a smooth rotor surface and cutting tools arranged in a spiral pattern helps direct material flow so that energy is reserved for production. Depth control rings control the depth of the cutting tools’ bite while providing impact protection to the tool body and reduced shock loading to the driveline. This style promises faster cutting of materials, better fuel efficiency and more uniform particle size. Rotors with low-profile rotor bars, strong forged tool holders and a staggered tool pattern provide a balance of durability and performance, along with aggressive in-feed of materials. This design guards against wrapping of materials. It promises versatility in a variety of wood shredding applications. One of the most important factors related to both productivity and machine maintenance is how well the rotor is balanced. Most of these rotors are turning 2,000 to 3,000 rpm. While a well-balanced rotor with the proper tools will produce, a rotor that is out of balance will not only not produce, but it will also shorten component life and increase machine maintenance costs. The rotor is a drum which holds the cutting tools. Several rotor styles are available to suit customer preferences, depending upon what kind of conditions will be encountered and what type of cutting tools will be used. A variety of different cutting tools are available to suit differing rotor styles, with some tool types better suited for certain applications than others. Whenever possible, match the cutting tool to the projects that you anticipate — understanding that nobody predicts perfectly. All tools will perform to some degree in virtually all settings, but the closer you can match your tool to their optimal feed, the more efficient and productive you will be. Knives feature a sharpened cutting surface that cuts rather than pulverizes the material. They are similar to the knives found in a tree chipper. They typically produce a finer, more uniformly sized material than carbide tools, for example. Knives can be sharpened numerous times before they require replacement, and some knife styles are double-sided, allowing the operator to flip them once they are worn on one side. While knives are very effective in light brush and clean materials, they are prone to damage and breakage when they encounter rocks and foreign debris and also wear faster when engaged in the soil. Carbide cutting tools are versatile and are typically better suited for hard woods and varied material streams. Single-tipped carbide designs are more aggressive with hard wood, while double-sided carbide designs are more versatile — providing a mixture of performance and durability. Often single and double-sided carbide tools can be used in combination on the same rotor to deal with ever-changing materials. When working in areas where rock cannot be avoided such as near gravel creeks or in areas where limestone is shallow, it might be wise to opt for stone tools. These provide good durability and wear life in challenging conditions, especially where a lot of ground engagement is anticipated. For very severe conditions, many manufacturers offer severe-duty tools. Generally, these are variations of the carbide tooling, sometimes with additional hard facing or wear plates added to slow the body wear in highly abrasive conditions. One question that often arises is: How long will the tools last? It is difficult to anticipate service life for tooling because conditions vary from job to job. Operators also play a key role in tooling life. While tooling is well suited for shredding brush and woody debris, any tooling will wear faster when exposed to a steady diet of dirt. Some manufacturers claim that tools have an average life of over 300 hours. Your mileage may vary. As you continue your search for a mulching attachment, keep in mind the vital role that the carrier plays in the process. Proper hydraulic flow and pressure are essential for the optimal functioning of any attachment, especially those with high torque requirements, like mulchers. While manufacturers offer suggested flow ranges, these often vary. Pressure and flow at the lowest ends of your specified ranges means that your mulcher will not be as effective as it would be at pressure and flow delivered at the higher ranges. For example, if all of the hydraulic pressure and flow is used to operate the mulcher, there is no extra capacity to move the carrier around the jobsite. The dynamics on the cutting surfaces may also be impacted, and you are likely to see less service life from wear parts at this range than at higher flows and pressures. In addition to the components indicated, there are additional items to consider, such as material type and thickness used in the construction of the housing. Always look for the weakest link — that will likely become a problem area. If the rotor is stout, the tools are well suited and you have proper hydraulic flow and pressure, but the housing appears flimsy, then you might be setting yourself up for problems. Rotor bearings are also worth considering — as are the internal counter cutters for material sizing. When you are working in a remote jobsite, the last thing you want to do is break down. The best kind of maintenance is no maintenance, but that rarely exists in forestry equipment. At a minimum, you should plan on looking over your mulcher attachment every day to check for broken cutting tools. Most knives can be sharpened, extending their life and reducing horsepower requirements. Ensure that the rotor rotates freely (with no material wound around or jammed into the bearing housing). Hit the applicable zerk fittings with grease, and you should be good for another day. On a weekly basis you’ll want to check for any hydraulic leaks and closely inspect the bearings. Once a month or so, look for any sign of metal fatigue. Annual maintenance required includes balancing the rotor. In addition to the basic components listed, virtually all manufacturers offer options to simplify the operation and maintenance of your mulcher. A push bar can help to fell standing trees, while an optional trap door contains materials within the rotor area to achieve finer sizing. Some manufacturers are now offering a rotor-balancing kit to allow this important maintenance function to be performed at the owner’s maintenance facilities. Whether you are looking for a mulcher attachment with all of the accessories or a bare-bones version to get started, there is plenty to consider. Dave Maddock is a product manager at Fecon.